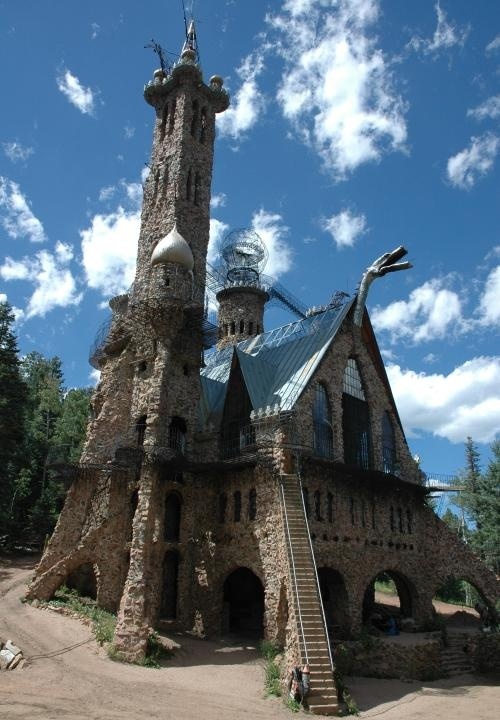 Bishop Castle started as a family construction project situated in the Wet Mountains of Southern Colorado in the San Isabel National Forest located North West of Rye, Colorado. The castle is named after its constructor, Jim Bishop. The Castle is located in south central Colorado along a paved public road, State Highway 165, approximately 13 miles (21 km) southeast of the junction of State Highways 96 and 165. This road is part of the Frontier Pathways Scenic and Historic Byway, and Bishop Castle is shown on the official map. Construction of the castle began in 1969, when Bishop began construction on a family cottage, which he decided to surround with rocks. Several neighbors noted that the structure looked something like a castle. Bishop took this into consideration and soon began building his castle. He had bought the land when he was fifteen for a price of $450. He has faced numerous challenges with the local and state government over ownership and activities on the site.